It' s what we' ve all been waiting for and it' s a fantastic Battle Royale version in the purest Minecraft style. We are facing a very complete game in which you can face multiple players online and show that you are a survivor in this type of games. You have several modalities to play, from the death game by teams to the awaited Battle Royale. Fall in the area of the map that you like and start exploring the buildings in search of weapons and resources that will help your survival. Get the last one alive in the arena and win all the games of Minecraft Battle Royale. 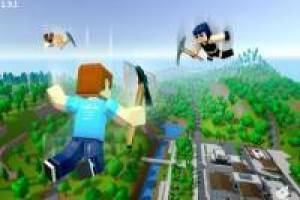 Enjoy the game Minecraft Battle Royale, it's free, it's one of our Battle Royale games we've selected.